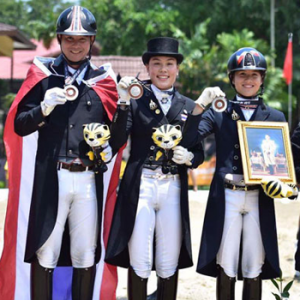 A Mahidol University International College (MUIC) alumna, Ms. Pakjira Thongpakdi (MUIC Class of 2014), was a member of Thailand’s dressage team led by Her Royal Highness Princess Sirivannavari Nariratana that won the silver medal at the recent 29th Southeast Asian Games. The competition was held on August 22, 2017 in Selangor, Malaysia, with the Thai team racking up a combined score of 206.211. Ms. Pakjira and a teammate moved to the dressage individual final on August 24 with the THM alumna getting a top score of 71.711%.